Plans are underway to renovate 203 Health Centres in the state, Executive Secretary, Ondo State Primary Healthcare Development Board, Dr. Francis Akanbiemu has revealed. Akanbiemu revealed this while speaking with The Hope during the two-day training on the development of minimum service package for primary healthcare centres yesterday, in Akure. According to him, the Governor, Arakunrin Oluwarotimi Akeredolu (SAN) is putting in place necessary measures to ensure that the people of the state access qualitative health care services. 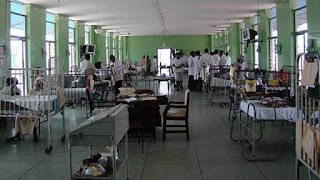 Speaking further, Akanbiemu revealed that the present administration intends to have at least a functional Primary Healthcare per ward, saying “the target is to reach 203 which is to enable a ward have a renovated health centre in order to make it suitable for the provision of quality healthcare services to the people of the state at the end of the renovation exercise. Speaking extensively on the training, he explained that it is aimed at enabling the state to have a specific health services document which is suitable for the people. According to him, the document will address the health needs of the people and the human resources needed to provide qualitative and efficient health care services to the people. The plan, according to Akanbiemu, will also enable the state access the basic health care provision fund from the Federal Ministry of Health which is one percent of the consolidated revenue accrued to Federal, State and Local Government. Speaking further he said; “One of the major requirements for every state is the minimum service package so as to access the fund. Also speaking, Director, Planning, Research and Statistics, Dr. Yetunde Olagbuji described minimum service package as one of the key pillars of PHC under one roof and added that it provides the platform for the state to have a costing and investment that will enable it plan at the PHC level. According to her, it is required that each ward should have a functional PHC facilities.